Lunarfurniture.dom – There are some people who are quite lucky to get a large house, but there are also some others who are only able to get the small house. If you are one of the unlucky one who get the small house, don’t worry. Small house doesn’t mean you won’t get the nice atmosphere of the house, especially in the kitchen. As we already know, kitchen is one of the best places in the house which we can use as the gathering area of the whole family member. While cooking, you and the other family member can have conversation which can tighten the relationship among family members. Well, this kitchen philosophy as the gathering spot can be a trouble when we have a small size kitchen, but, you can make the kitchen become a larger place if we do some tricks bellow. The first thing that we can apply in the kitchen is by reducing the unused kitchen appliances. By minimizing the amount of kitchen appliances, then we can arrange the frequently used kitchen appliances easily. Good arranging means that your kitchen won’t look so messy. After being washed cleanly, you can put the kitchen appliances inside the storage racks. You can put the storage racks near the washing sink in order to make you easy to keep them. The storage racks can make the appearance of the kitchen looks so empty and wide, especially if you also can put the microwave, toaster, can opener, or even spices racks under the kitchen table. Whether your house is small or large, it is better to separate the dining table and the kitchen. If the kitchen has no dining table, or even if you can put the appliances cabinet on the dining room, then it must be look so empty and wide. If you are clever, you can put a kind of big hole of the wall between the dining table and the kitchen. This space can make you move the cooked food easily from the kitchen onto the dining table. The last thing that you can do is by applying the open and stuck on the wall racks for the place of plates, glass, or multi colors kettle collections place. Well, besides of the open racks, you also can apply the bright colors for the kitchen appliances door cover. 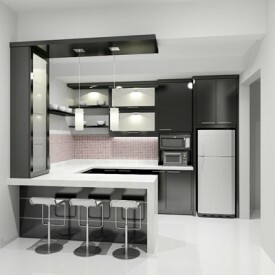 The bright colors can help the kitchen to be look like wider than its real size.